Fleas—the thing that fills most pet owners’ nightmares! They can make both your pet’s and your life one itchy hell! So, what can you do when your pup gets infested with these pests? Here are a few options for you. The first thing you can try in your fight against fleas is to employ some natural remedies. Special shampoos, for example, can be effective and are completely harmless to your pet. However, treating your dog with these shampoos can be a feat. They usually require pets to be still and stay soaped up for about 10 minutes, so if you know your pup can’t handle it, don’t even bother. But, if you have a calm, water-loving dog, it can be quite effective. If you combine the shampoo with a flea comb, you can get rid of all fleas. Probably the most effective way to free your dog of fleas is to use a chemical treatment, although some people are (quite unnecessarily) reluctant to use it on their four-legged friends. There are spot-on treatments like Advocate for dogs that are super easy to apply, provide almost instant relief and protect your pet from annoying pests for up to a month! It removes both adult fleas and their larvae, disrupting their life cycle. These treatments that destroy both young and adult fleas are the best options since they will keep your pet protected for much longer. Today, there are even some pills that are taken orally and can kill fleas and disrupt their life cycle. They are popular because they are very easy to give (most are very tasty to dogs) and work fast. However, make sure to consult with your vet before you decide on flea medication and read the label very carefully. Some brands are not suitable for puppies or old dogs. An additional preventive you can provide for your dog is anti-flea collars, even though they mainly protect the head and neck area. In order for it to work and transfer the chemicals across the fur, the collar has to make contact with your dog’s skin, but make sure not to put it on too tight. You should be able to fit two fingers between the collar and the neck. However, some dogs can develop an allergic reaction (although quite rarely) so make sure to remove the collar if your dog starts scratching too much. To keep the fleas from re-infesting your dog, make sure to wash your pup’s bedding, kennel and pay special attention to their favorite places to sleep and play. When you wash these places and things with a strong detergent, you will be able to get rid of fleas, larvae and eggs quite effectively. If you can put fabrics in the dryer, don’t hesitate to do so and feel free to crank up the temperatures. Heat helps you achieve the best results. Additionally, try to clean and vacuum your home at least once a week. Your pets roam around your home, sniffing around and leaving fleas all over the place. 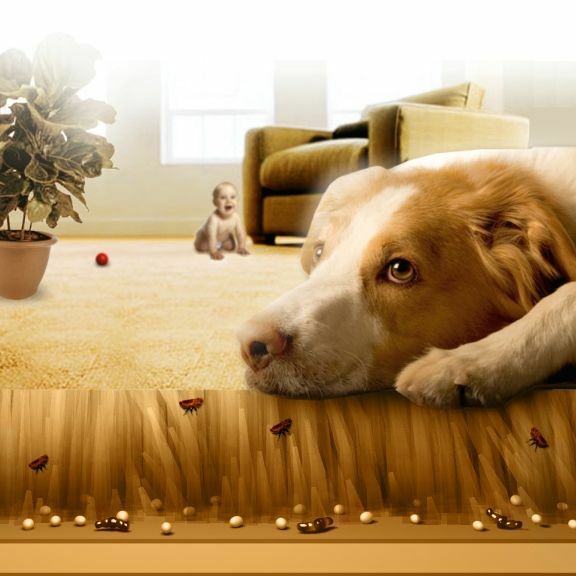 But, thorough vacuuming can prevent fleas from multiplying and taking over your entire home. Don’t forget to treat your outdoor space as well. Keep your landscaping trimmed and consider using a spray, but be careful with the dosage. They can be quite harmful to the environment if not used properly. Fleas are a real nuisance for your pets and for you, but if you try some of these solutions, you’ll surely get rid of them and free your dogs from a huge bother. Feel free to follow these tips, but make sure to consult with your vet to ensure your furry friend is safe and happy.